Grist mills were an important part of everyday life in South Carolina during 18th and 19th centuries. Corn and wheat were ground by hand before the invention of grist mills. Grist mills were named for grist meaning grain and a mill being something which grinds. They look like complicated machines, but they really work on simple principles. Each part must be kept in perfect working condition for the mill to operate properly. Mills were built on fast moving river streams so that the water would be the power source. A dam was also built near the mill to widen and deepen the river, which created a millpond. There are two types of wheels. The undershot wheel uses a swift stream or waterfall to power the mill. The water strikes the paddles near the bottom of the wheel, causing the wheel to revolve in the direction opposite to that of the flow of water. The overshot wheel works somewhat differently. Water from the millpond is taken through an open trough to pour on top of the wheel. Water pouring over the top turns the giant wheel. Mills usually have three floors. The first floors housed the gears, while the second floor held the grinding stones. Grain was stored on the third floor. Gear wheels turned four times for every one time for the grinding stones. Millers would put animal fat on the gears to avoid sparks caused from friction. Fires were a horrible threat due to the amount of grain stored at mills. The bottom mill stone was called a bedstone and did not move. The top stone was called the runner. A stone spindle passed through the stones in the center. Stonecutters would create patterns in the stones. The flat areas were called lands and grooves called furrows. Furrows ripped off the outer husks of the grain and directed the ground flour to the outer edges of the stones. Every few weeks the furrows needed to be re-cut. Mills reflected the region’s early economy, which was independent, self-sustaining and based on the family farm. A few of these gristmills survive in renovated or reconstructed form. 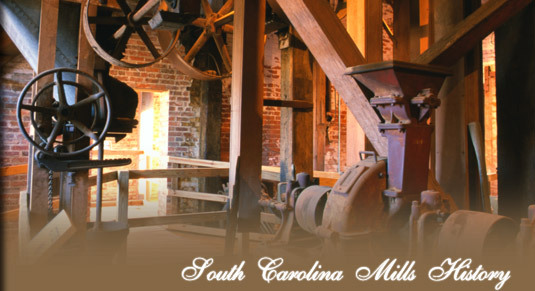 We hope you will visit these historic treasures in South Carolina and get a glimpse of mills and mill-life from the 18th century all the way to the current day.